I went into Sur la Table on a mission - to buy a perforated pan. I've had a hard time trying to find one and I struck out here as well. But since I was there, I figured I would check out the clearance shelves. And wouldn't you know it, but they had english muffin rings! I've been wanting those. And a ravioli cutter, which I really hope works. 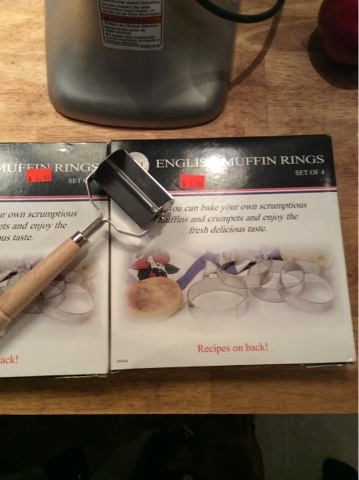 The rings had a recipe for english muffins on the back, which I'll have to try. And post pictures. And make breakfast sandwiches. Not quite sure what kind of perforated pan you are looking for...Restaurant Depot has perforated steam table pans or maybe one of those perforated pizza pans would work? Actually, now that I'm thinking about it, those grill top trays that keep things like shrimp from falling through the grates are perforated too. Maybe something like that could work?